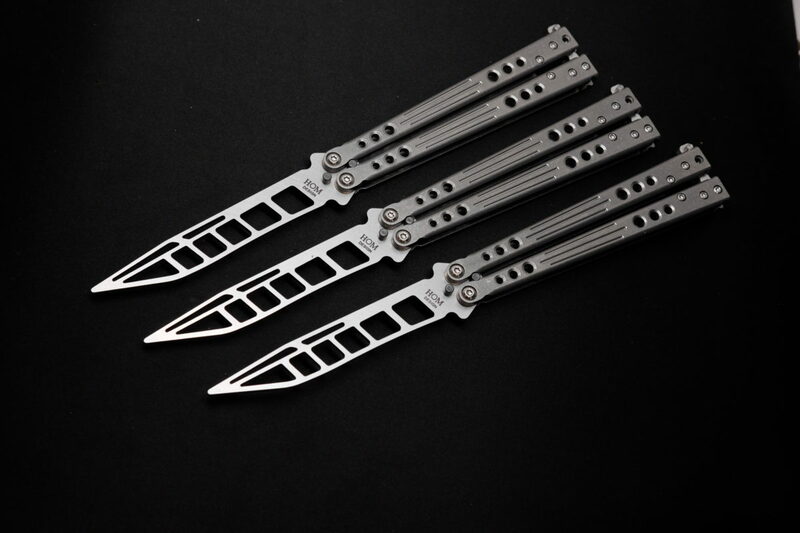 The Rhapsody Trainer is a premium balisong trainer and features blade design elements from the Tempest with longer handles (same length as the Basilisk-R) and new design elements that are both functional and cosmetic. The 154CM heat treated blade of the Rhapsody has been significantly lightened to better mimic the balance of a hollow ground live blade. The titanium handles on the Rhapsody have a new unique pattern that offer lateral grip lines as well as lightening holes on both ends. The handles are offered in a stonewashed finish, or anodized. The stonewashed version wears extremely well and hides even major scuffs and scratches. Other improvements include rebalanced stainless steel spacers and a titanium latch. The precision bushing system is kept within this model and yes, the trainer does ring when you flip it!